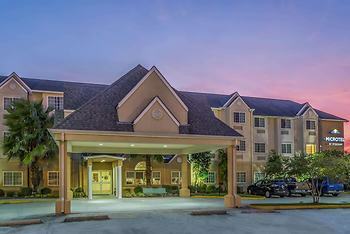 Hotel Microtel Inn & Suites by Wyndham Houma, Houma, United States of America - Lowest Rate Guaranteed! A stay at Microtel Inn & Suites by Wyndham Houma places you in the heart of Houma, just a 4-minute walk from Westside Girls Softball Complex and within a 5-minute drive of The Lakes Soccer Complex. This hotel is 1.6 mi (2.5 km) from Southland Mall and 2.5 mi (4.1 km) from Southdown Museum. The hallways smelled of stale smoke. Very comfortable bed. Neat, efficient room. Internet available and handy. As I step off the elevator, there was a strong odor of cigarettes smell on this floor. I asked for non smoking room when the reservation was made. Also, I was asked to sign a form that I would not smoke in the room!!!!!!! What is this about? I am non smoker. On this floor, there no smoking labels on the door but there a horrible smell of cigarettes.This was on the 3 floor. Great location, clean facility and friendly staff. Everything was great, I trailered y otorcycle there, the stafflet me park the trailer and the motorcycle in front the door till the next day when I un-loaded it. After that they let me parkit in fron of the front entrance so they could keep an eye on it.Better service than I expected will definetly stay there next trip. Thanks to all. LOVED the staff, loved the coffee. They serve Community cafe style. They can't make it fast enough in the am. My next Microtel was only 51.99, a bargain I really appreciate. I think this one is too high. Found rooms very clean & relaxing. Beds & T.V & pillows very nice. Staff very attentive to guest needs. Yes, the only 2 things that were a little annoying was when guest left room it made lot of noise. Also we were on first floor & you could hear people walking back & forth everytime they moved. These problems were not fault of staff but the construction of how hotel built.